Phil Humphreys started Humphreys' Outdoor Power in 1966 with his wife Joyce Humphreys. It has since become a premium Kubota and Stihl Dealership and repair shop. Phillip and Joyce Humphreys moved to Greencastle Indiana in February of 1966 with their 3 year old daughter Ginger and their 2 year old son Brian. The previous summer, Phil had helped a Wheel Horse Lawn Tractor dealer at a county fair. Upon recognizing Phil's innate mechanical ability and ingenuity, the dealer graciously pointed out that there was an opportunity for a dealership similar to his in near by Greencastle. Phil and Joyce seized the opportunity, loaded up the kids and set off on their entrepreneurial journey. Phil and Joyce set up shop at 106 W Jacobs St in Greencastle. With a small shop located behind their house, Humphreys' Wheel Horse was born. 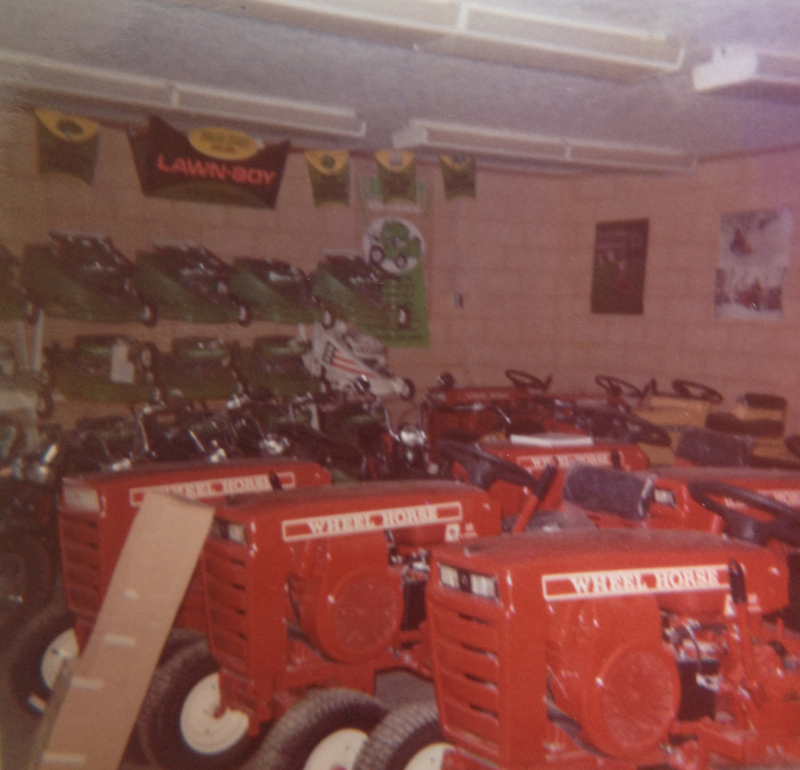 Along with Wheel Horse, Phil sold Lawn Boy push mowers and Lombard chainsaws. 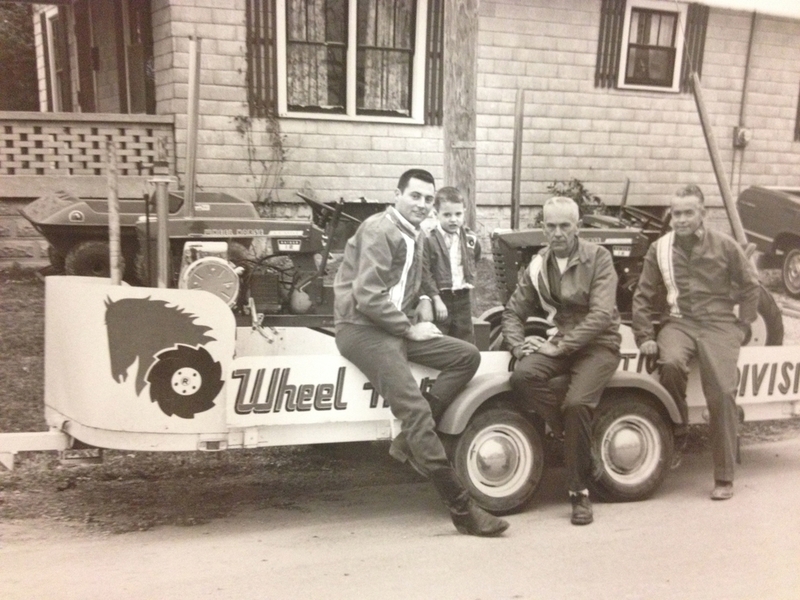 The original Humphreys' Wheel Horse circa 1966. Fun Fact: the year Humphreys' Wheel Horse launched, there was a terrible drought (not good when you sell lawn mowers for living). Phil decided to pick up the Rupp Mini Bike line, a product that would during a drought. Phil attributes this product's success with getting him through his first year. Fun Fact: Did you notice how the door is open? The latch on this door was broken. To lock the door Phil would push a wWheel Horse lawn mower up against the back of the door, then put the tractor in gear so that the mower wouldn't move and the door couldn't open. 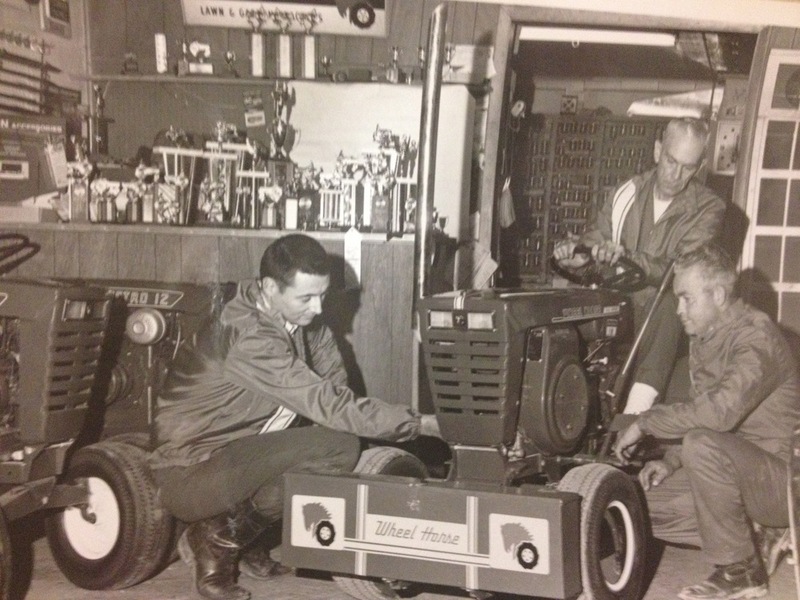 Phil Humphreys, Woody Porter (seated) and George York working in the Humphreys' Wheel Horse show room on Phil's hobby at the time, Garden Tractor pulling. Fun Fact: Using his mechanical knowledge, Phil, amassed quite a collection of garden tractor pulling awards (notice the parts counter and behind) and even won a state championship in his class. Phil, young Brian, Woody Porter and George York made up the Humphreys' Wheel Horse pulling team. Fun Fact: Woody Porter was a service technician for tractor specialties which was the main Ferguson distributor, selling Ferguson tractors straight out of England. After they went out of business he became a mailman. George York was a Schwerman driver, they hauled concrete all over the state. He worked as a part time mechanic at Humphreys, then after his retirement from Schwerman, drove the delivery truck for Humphreys. 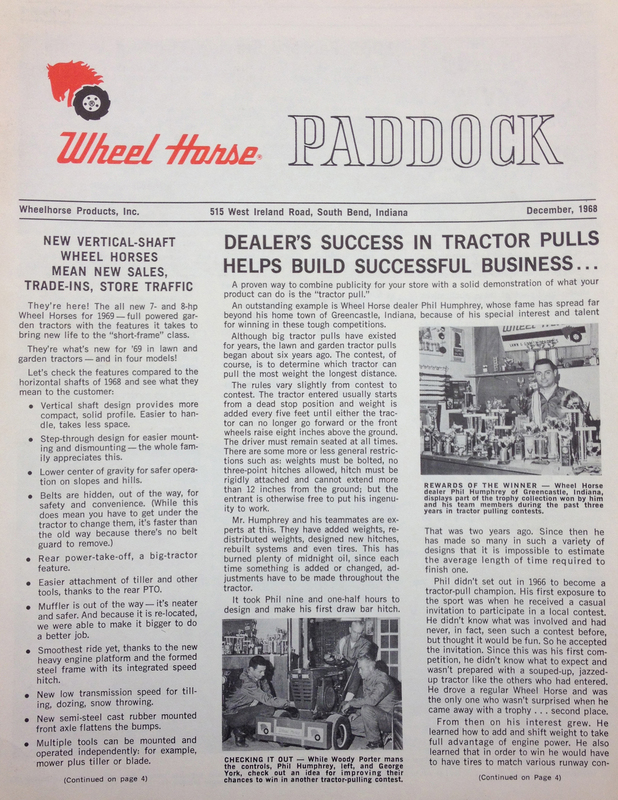 This was Humphreys' Wheel Horse featured article in Wheel Horse Paddock, the national Wheel Horse Dealer magazine at the time. Phil helped promote Humphreys' Wheel Horse helping with a tractor pulls and with general repairs. Wheel Horse selected 10 dealer from across the U.S. to discuss product and corporate management. Humphreys' Wheel Horse was one of those 10, and stayed on the board until after Toro purchased Wheel Horse. Humphreys' has always prided itself on keeping a large inventory on hand. Even as far back as 1972! After 6 years of success in the business, Phil & Joyce found their shop cramped. 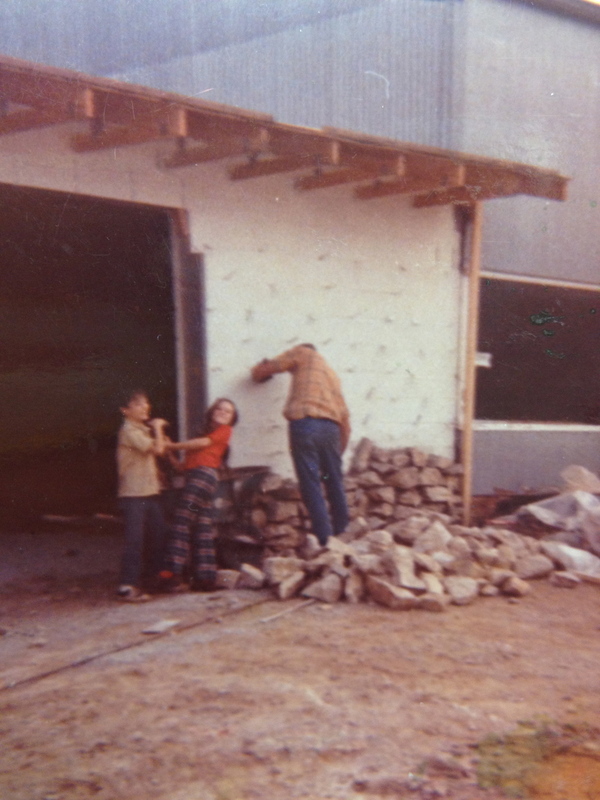 It was at this time, in 1972, that they moved to 950 N Jackson St in Greencastle. Fun Fact: While Phil payed to have the roof completed, most of the building was constructed by him and few friends. He laid all the rock himself. Growth meant adding on to the fleet. Here is the fleet after the move to the Jackson St location. in 1978 after moving to the larger location Humphreys' picked up the Kubota Tractor line. This is an example of the early Kubota literature around the time Humphreys' added the product line. Rodney Humphreys, one of our early Kubota customers using his new Kubota. The showroom at 950 N Jackson St in Greencastle. By the time the 80s rolled around, Humphreys' Wheel Horse was an established part of the community. 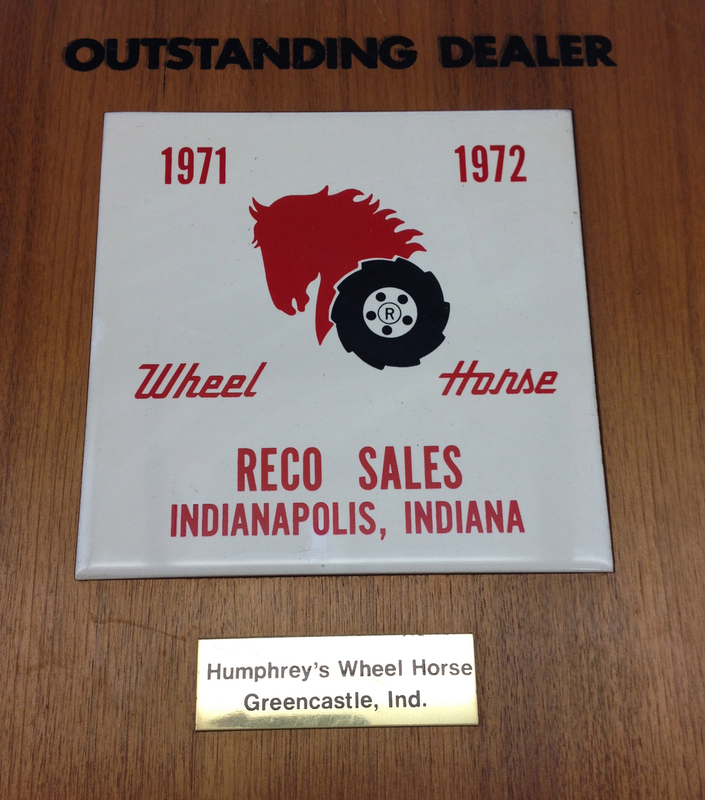 Wheel Horse continued to recognize Humphreys' with awards. It was also in this era that Brian decided to come into the family business. In 1985 Brian decided to join the family business. 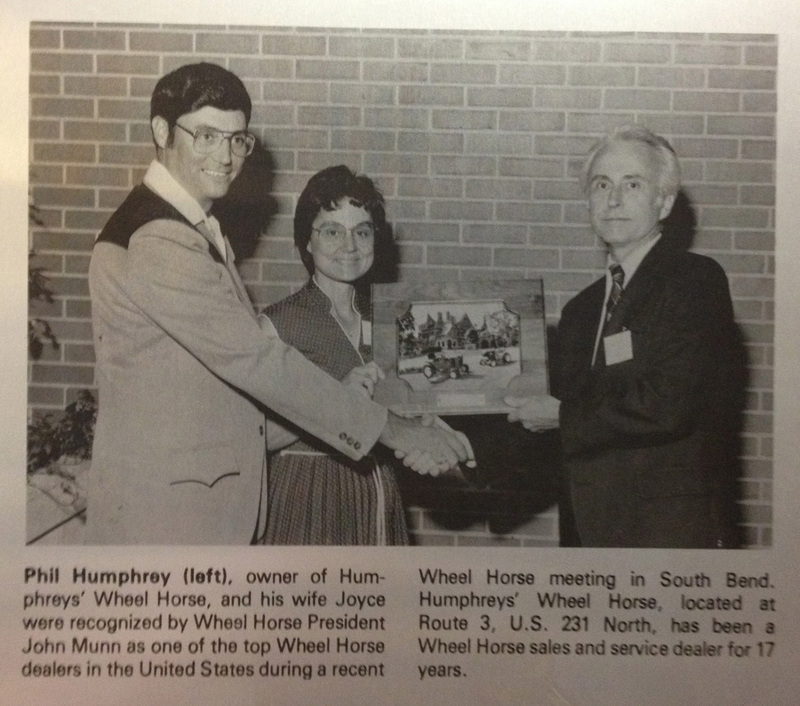 In 1988 Humphreys' Wheel Horse was featured in Wheel Horses product guide as a prime example of what dealership should do and offer. Brian and Kandy Humphreys Accepting the Wheel Horse President's Club award in 1989. Brian and son Camron in 1989 at the Putnam County Fair! In the early 90s, Humphreys' decided to change their name so they could focus on a more broad range of brands. Enter Humphreys' Outdoor Power. In addition to changing their name, they increased the size of the shop, adding two more work bays. In 2001 Humphreys' picked up Stihl Outdoor Power Equipment. 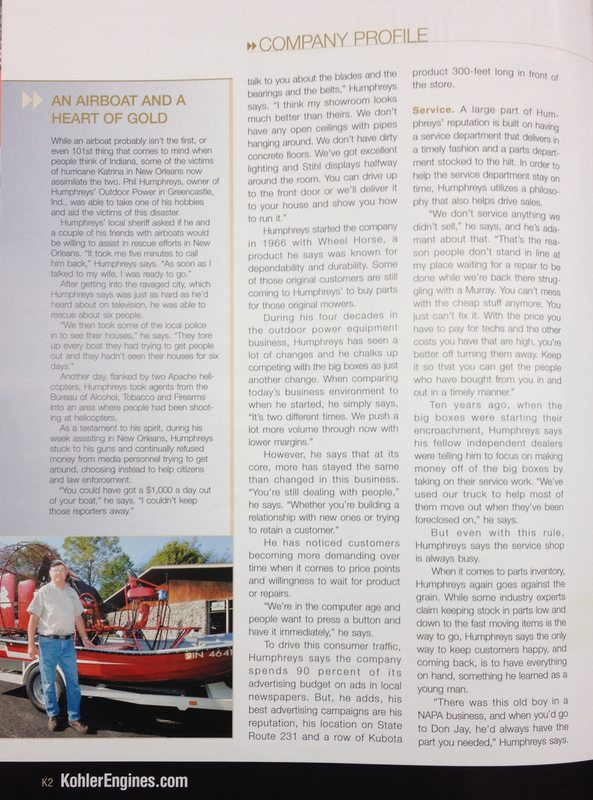 In 2005 Kohler Engines featured Humphreys' Outdoor Power in their quarterly dealer periodical Engines in Action. Their company profile included a feature on how Phil and Brian had signed up to take Phil's airboat to New Orleans immediately following Hurricane Katrina. They left with the Putnam County Sheriff's department to help rescue trapped residents. In 2005 we started carrying the local brand of Dixie Chopper! Humphreys' has won the Bryan Equipment Top Gun award every year since 2006! This is awarded for excellence in sales. In 2008 Phil retired handing ownership over to Brian. Joyce still continues to work at the shop although travels frequently with Phil as he pursues his Cushman Motor Scooter hobby. He now designs, manufactures and sells custom performance parts for Cushman engines. 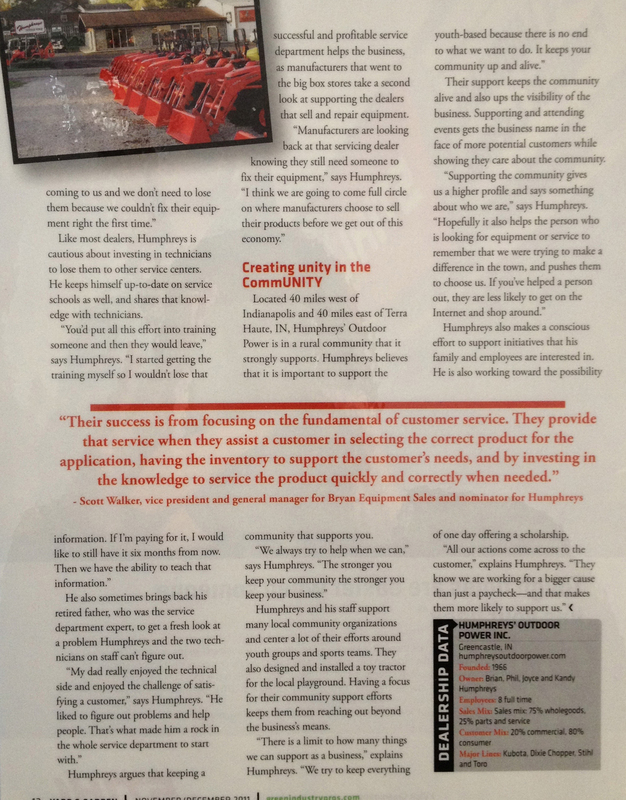 In 2010 Humphreys was named Dealer of the Year by their Stihl Distributor Bryan Equipment. In 2011 Yard and Garden named Humphreys' Dealer of the year! In 2013, Camron joined the Humphreys ranks. After Graduating from Indiana University and working for an Indianapolis Marketing firm, Camron decided to come back to his roots.